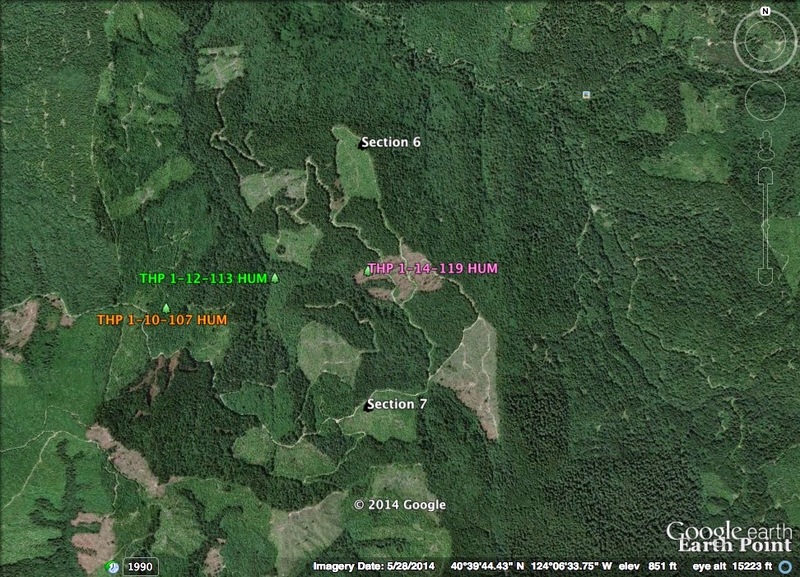 THPBlog: Green Diamond Resource Company to clearcut near the Headwaters Forest Reserve. Green Diamond Resource Company to clearcut near the Headwaters Forest Reserve. This THP is about 4 miles NE of Fortuna, CA and Highway 101 near the Elk River Trailhead and Headwaters Forest Reserve. Green Diamond Resource Company is planning a mostly clearcut feller buncher and cable logging operation in redwood and Douglas fir forests. The THP area flows into the Elk River which is listed as impaired for sediment and temperature. There are 10 landslide terrain sites in the THP area including rapid shallow landslide terrain in unit B, steep headwall swales in unit C, and deep seated landslide terrain in units E and F. Over 6,500 feet of temporary road construction is planned, and 1,600 feet of road re-construction is planned. 8 road drainage sites are planned for work including rocking, dip construction and culvert repair and replacement. Unit E and Road SA 2591 are within .25 mi of marbled murrelet habitat on BLM lands, and there are 4 osprey nest sites within .25 mi of the S-1000 haul road. Spotted owl nesting territories are located within .25 mi of units A,B,F and within .5 mi of units C,D,E. More information is available on the THP Tracking Center website.